Mark 15:46c-47 (NLT) [Joseph [from Arimathea] bought a long sheet of linen cloth, and taking Jesus’ body down from the cross, he wrapped it in the cloth and laid it in a tomb that had been carved out of the rock.] 46c Then he rolled a stone in front of the entrance. 47 Mary Magdalene and Mary the mother of Joseph saw where Jesus’ body was laid. We know from verse 42 that “evening approached”. According to Jewish time keeping, the Sabbath started at 6pm, when all work was not allowed, hence the urgency to get Jesus body into a tomb. I have set this scene at about 5:45pm. The setting sun (unseen, on the left) is bathing this scene in red/orange light. I have increased the blue shadows in this scene, compared with Mark 15 – Burial of Jesus – Scene 03 – Into the tomb (Sunset version), thus representing the darkening light of the approaching evening. 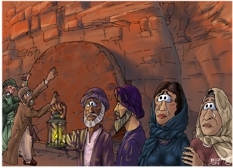 Joseph from Arimathea is carrying a candle lantern, which also provides a yellow light; it can be seen reflecting off various characters present in this scene. From left to right: Three servants rolling the large tomb stone over the tomb entrance. Joseph of Arimathea & Nicodemus, then Mary Magdalene and Mary (wife of Cleopas – Joseph & James Little’s mother – sister of Mary (mother of Jesus)) watching. 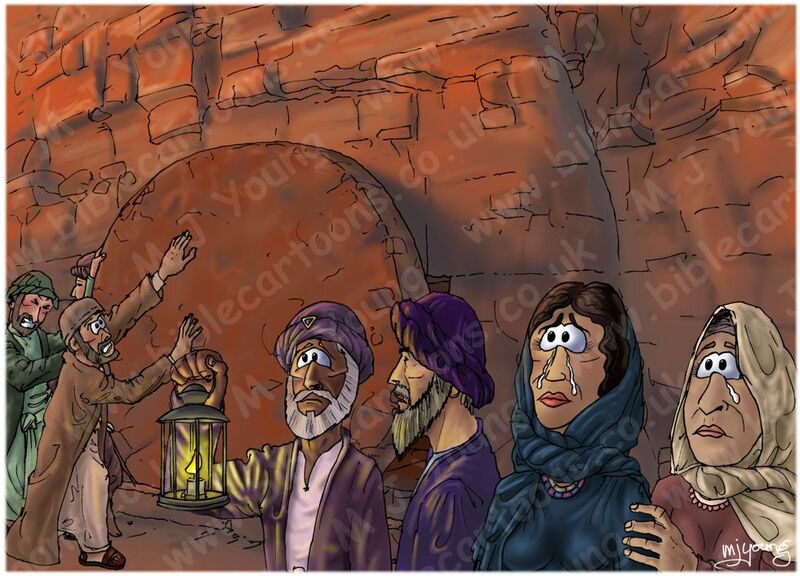 This is the last scene in the Mark 15 – Burial of Jesus series. I have just completed it on 30th April 2015 – only 4 days away from Good Friday! The colours for the background, & the design of the cliff come from a previous scene: Mark 15 – Burial of Jesus – Scene 03 – Into the tomb (Sunset version). The characters present have also been included in previous scenes in this Easter series, which increases the sense of continuity across the scenes. How large was the stone rolled across the entrance to the tomb? Other Bible versions translate “a very large stone” (eg Amplified Bible, The Message, New Century Version, et al). 46 And Joseph bought a [fine] linen cloth [for swathing dead bodies], and, taking Him down from the cross, he rolled Him up in the [fine] linen cloth and placed Him in a tomb which had been hewn out of a rock. Then he rolled a [very large] stone against the door of the tomb. Whilst Mark 15 doesn’t seem to indicate the size of the stone, the following chapter (Mark 16) does. In all of the Bible versions I have looked at, they variously refer to the stone as being “very large” (NLT, NIV, AMP, NKJV, ESV, RSV, NRSV, GW, NCV, HCSB), “huge” (Message), “very great” (KJV), “exceeding great” (ASV), “of great size” (BBE), “of immense size” (Weymouth). From Mark chapter 15 it seems that the stone that covered the tomb was both large enough to cover the tomb’s entrance, but was notable for it’s very great size. [Source: Adam Clarke, A Commentary and Critical Notes.